Breaking every rule in camping, my husband and I cooked once inside our tent. Outside, a summer storm rattled our walls and rained down in gusty sheets as lightning flashed overhead and thunder cracked all around us. After boiling Annie's macaroni in a saucepan with mini cheese bratwursts, we enjoyed steaming bowls of pasta studded with pudgy little fingers of meat that tasted like bliss. Pockets of cheese oozed from the brats with every salty, fatty bite. It was one of the finest meals I've ever had. Summer in Vermont means prime camping season, and anyone who spends time in the backcountry will tell you that the further you are from a paved road, the better food tastes. But many will footnote that observation with something like "Probably because you're so hungry." That may be so — vigorous outdoor play brings on a healthy appetite. According to literature from the National Outdoor Leadership School, backpackers burn 2,500 to 4,500 calories per day, while "normal" activity tops out at about 2,500. Replacing so many calories may make meals taste better, but it also offers an opportunity to indulge in fatty, rich food and then burn it off on the trail the next day. In its 1938 Lookout Cookbook — issued to staff headed to far-flung regions in the first half of the 20th century — the U.S. Forest Service provides a recipe for "baconized corn and macaroni." The corn-studded mac in a milky homemade white sauce is topped with strips of bacon and baked. It's minimalist and fairly dated, but the idea could fly in a modern camp kitchen with boxed mac, bacon and a Dutch oven or outdoor-style fry-bake pan, which is basically a wide, flat-bottomed pan with a good lid. From where I sit, baconized anything seems like a fine idea for the woods. Cured pork belly, particularly when purchased in slabs, keeps for days unrefrigerated and meets all the backcountry nutritional requirements: it's high in fat, salt and protein. At the Vermont Youth Conservation Corps (VYCC), conservation program director Christa Finnern is responsible for feeding hundreds of kids al fresco as they build and restore trails, among other projects, for six to eight weeks at a time. Finnern says protein is a perennial challenge: "Our biggest focus is trying to provide enough protein to our crews because they're physically exerting themselves in a big way," she says. Finnern notes that VYCC relies on rice and beans and "simple, versatile things that allow you to use the same ingredients to make different things. I always come back to nuts," she says — "because you can eat them plain, put them in bread, oatmeal or in dinner" — and cheese. "A lot of people don't think to bring cheese camping because it needs to be refrigerated," she says, "but we keep our cheese for a week without refrigeration, and it's fine. You can put it in anything — eggs, burritos, pastas, whatever." Indeed, in its 1954 edition, the Lookout Cookbook mentions cheese 95 times in about 70 pages, telling cooks to add it to everything from biscuits and breads to sauces, soups and vegetables. If spoilage is a concern, the book recommends managing thus: "To prevent cheese from molding, wrap in a cloth wrung out of vinegar. Then roll in paper." That edition of Lookout also suggests pan-frying cored, diced apples until brown and serving with brown sugar. As a child, I went to Girl Scout camp and recall that we cut apples in half, cored them and stuffed them with brown sugar and butter, then cooked them in aluminum foil right in the fire. I still make this sometimes and, for backcountry apple crisp, cook it topped with loose granola. For extra Vermont-y deliciousness, melt sharp cheddar over it all. If there's romance in the air, this recipe never fails to impress a special someone. Seyon Lodge State Park innkeeper Tiffany Soukup, who spent the last decade camping around the world and chronicling her adventures on her blog Vagabond Way, says she likes her apples dipped in caramel. ("Ooh, apples!" she says wistfully when I ask about packing fruit. "Pears: disaster. Peaches: disaster.") "Apples with caramel are a great treat," she continues, adding that she buys the sweet stuff in jars and repacks it in sealable plastic containers. "I'm always thinking about packaging: Is it going to break? Is it going to cause more trash I'll have to carry around?" she says. Soukup also routinely camps with Nutella and peanut butter in plastic jars: "Those are really like power foods!" she says. At the U.S. Forest Service Green Mountain & Finger Lakes National Forests office in Rutland, public affairs officer Ethan M. Ready says that rangers report that more and more campers are taking camp cookery to the next level. "People are trying to get away from traditional hot dogs and beans and marshmallows ideas about camp cooking," he says, "and trying to make the experience a little more adventurous" with fresh, whole foods. 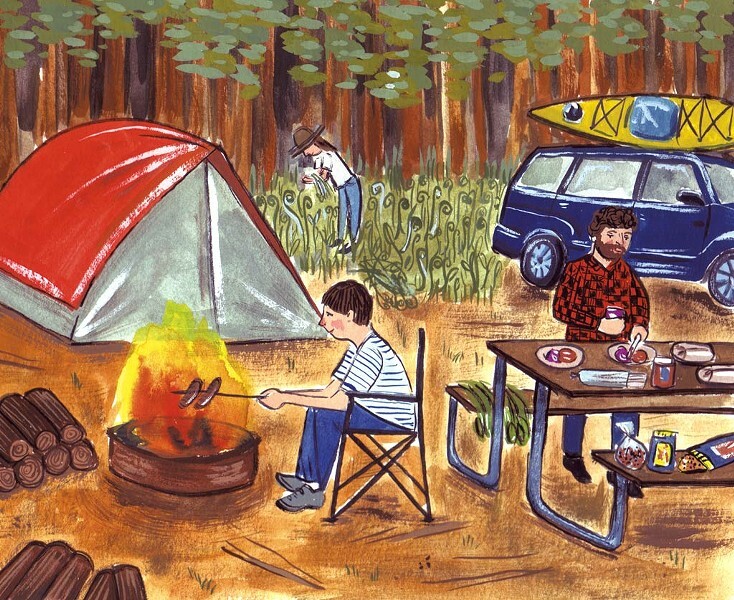 "Tin foil can be your best friend if you're out there camping with an open fire," Ready adds. "You can pretty much use that in your coal bed to make a stew ... Add ground meat and vegetables and spices, close it up, and let it simmer and cook." This method works great with everything from corn, cabbage and potatoes to peppers, asparagus and beans. At Burlington's Outdoor Gear Exchange, online sales specialist Nick Irvine also digs a good backcountry stew. "Some friends and I hiked up to a cabin to do some backcountry skiing," he writes in an email. "We each hiked in ingredients for a stew ... The main ingredient was some fresh lamb chunks that we bought off of a local farmer, whose farm was on the way to the cabin. We cut up onions, parsnips, potatoes, carrots, celery and garlic and let it stew with the lamb and herbs for eight hours on a wood stove, while we skied and took breaks to stoke the fire and stir the stew. This is easily one of the best meals I've ever had," Irvine says, "not just because the food was spectacular, but because I was sharing a homemade stew, cooked miles from any home." Irvine says he also sources fresh produce straight from the woods whenever he can. "Fiddlehead and ramp season is a great time to do some fancy backpacking cooking," he writes, adding, "[That's] not something people should depend on, but fresh veggies are hard to come by on the trail. These two are easy to find, and easy to identify. Fiddleheads boiled for a minute or two, then sautéed in butter with salt and pepper, cannot be beat! So satisfying to find and eat such a delicious snack." At my behest, Irvine conducts a quick OGE cooking survey and reports that Sarah Heerhartz, who works the sales floor, offers backcountry brownies as a go-to: "Take a Ziploc bag of chocolate chips, put it in warm water and let it melt, mix with crushed-up graham crackers and coconut flakes. [Then] roll them into sections and let cool." My sister-in-law Kristine Egan, a pastry chef at the Culinary Institute of America, has a similar no-bake treat: "Mix peanut butter, brown sugar, confectionery sugar and butter, melt it all together in a pan and let it sit until it hardens," she says. "You could put chocolate chips or peanuts or whatever in there ... It's just so easy, satisfying and yummy." Egan spent months in the backcountry in the Appalachian Mountain Club's White Mountain hut system, among other outdoor adventures, and, sibling bias aside, I can say her desserts are the best. Easy sweet treats make for happy campers, but these desserts also hit the three major forest food groups — protein, fat and salt — that are integral parts of a healthy backcountry diet. And that's an integral ingredient of outdoor safety, Ready is quick to note. "Really, you want to feel good and be nourished when you're in the woods," he says. "If you're going to be out in the middle of nowhere, you want to have the energy to keep yourself safe and healthy, and that means keeping yourself warm, hydrated and well fed." Ready reminds us that, wherever camp cooking is headed, it's a work in progress that evolved alongside and within our national forests and parks. "I think it's important to mention that camp cooking is something that's been going on since people started to appreciate nature as something enjoyable in its own right," he says. "So there's a lot of history there." All sources consulted on this story underscored the importance of backcountry ethics and safety: Pack out all waste and leave no trace, cook and build fires only in designated areas (and never in or near your tent! ), store food well away from camp and out of reach of animals. Also, observe fire safety: Drown out fires until they're cold to the touch, never leave them unattended, and use locally sourced wood to minimize the risk of bringing in invasive insects.